An additional 178kW system has been added to an existing 50kW install without any need for subsidy, months before the Feed-in Tariff closes to new installations in March 2019. Image: Eden Group. Eden Sustainable, working alongside developer Oakapple Renewable Energy, has funded and completed the project for the League One side. Completed at the end of May, the install – adding to a 50kW FiT-supported array already in place – was intended to add 450kW to the stadium. However, after the grid offer was reduced, a new 178kWp solar array was settled on, taking the total solar capacity to 228kW on the south facing side of the roof. Scott Burrows, director of Eden Group, said: “We did not need any other revenue streams to make this work because we knew we could execute efficiently and we knew that this developer was up for making this deal happen and was willing to do this at best value all round. Offering 100% self-consumption, the new array is predicated on a power purchase agreement with the football club, which will now pay a unit price of £0.085 compared to the almost £0.11 it was paying previously. This was made possible by the low technology costs, as Burrows explained: “What you can fit for these days is quite remarkable. If you had to you could install for £500 per kW in terms of crude kit plus a good installation team." The project was also made possible by the strength of the counterparties involved in the project. While Doncaster Rovers offered a stable offtaker for the PPA, as freeholder for the stadium Doncaster Borough Council provided exceptional covenant strength to support the project. “The fact that the council is standing behind the lease with Doncaster Rovers is clearly fantastically bankable,” Burrows said. “There is no direct financial benefit for the council but they are a brilliantly easy council to deal with and they are very aware of the greater benefit and so didn't need one. It's a very multi-use stadium, lots goes on off-season in the evenings so the council is very involved in this stadium and didn't need a direct financial benefit which is fantastic." 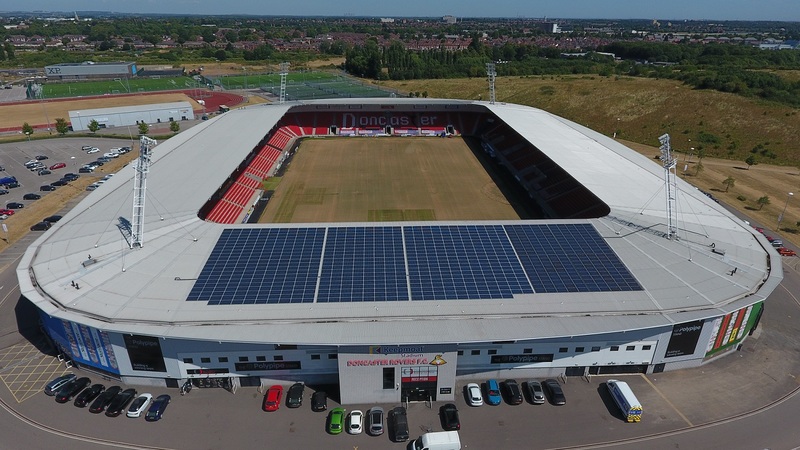 Speaking to Solar Power Portal last week, Burrows went on to say that despite FiTs coming to an end in March 2019, the Keepmoat Stadium install is ‘proof of concept’ that subsidy-free projects are already possible. However, they will likely require public sector backing in order to be successful. “That is going to be the focus for subsidy-free projects in the first instance from Q2 next year. We will have to revert back to where bankability is particularly important again for a period of time. Even with these circumstances, in which blue chip companies are also a target despite bringing “their own challenges for C&I developers”, Burrows remains confident that the post-subsidy world for solar is already here and, more importantly, can be a success. “We want the investment community to look at this and see that it works. Our debt providers Close Brothers are happy with it, we're happy, and our equity backers are happy with it. We want other potential PPA offtakers to look at this and see that they can still save. Burrows also believes the success of this project, and those to come, offers a moment of reflection for the FiT regime. Despite the “political palavas” that have made up the subsidy’s history, Burrows says the completion of subsidy-free projects like that for Doncaster Rovers shows FiTs have, all things considered, been a success. The Keepmoat Stadium project is among the 67 entries shortlisted for 2018’s Solar Power Portal and Energy-Storage.News Awards, with the winners to be announced at a prestigious gala dinner ceremony by guest host, TV personality and design expert George Clarke. Tickets and tables are now available to be purchased here, or by emailing Sue Bradshaw. For more information on the awards, including our independent judging panel, ticket pricing and how to purchase, please visit Solar Media's dedicated micro-site. The event will take place at the Hilton Metropole NEC on the evening of Wednesday 17 October 2018, bringing a close to the penultimate day of this year’s Solar & Storage Live, a three day exhibition and conference taking place over 16-18 October at Birmingham’s NEC.